Earn $9.10 in Rewards credit (910 points) What's This? All riders, all terrain. 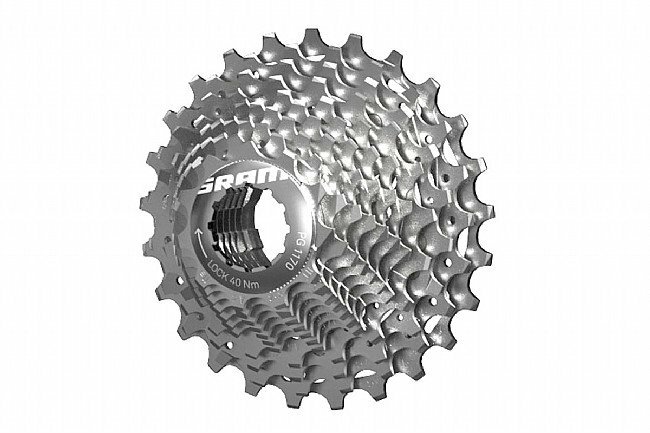 SRAM's most popular cassette goes 11-speed, providing even better gearing options. The 11th cog and updated tooth profiles go hand-in-hand with SRAM's cutting edge Force 22 groupset. When paired with the double crankset, you get 22 useable gears, right at your fingertips. Yet despite these changes, the PG-1170 still maintains all the core design features of the celebrated 1070 10-speed cassette. Heat-treated steel cogs ensure extended durability, and the largest four cogs are fixed to an alloy carrier for weight savings and stiffness. The PG-1170 Cassette is compatible with the Force 22 and Red 22 11-speed chains. It's available in a variety of gear spreads. The claimed weight is 231 grams (11-25T). great cassette for a 1x drivetrain I got the 11-36 to add just a bit more climbing gear over my 11-32. fantastic shifting and very reasonable weight. Needed just a bit more gear for steep gravel! I put this on my Gravel Bike (Sram Rival 1X drivetrain) to give me a little more gearing for steep gravel around here. Easy to install and didn't have change my chain either. Bike came with a 32 but the 36 just gives me a bit more help when I need it. I recently got this for my Tacx Neo for indoor Zwifting this winter. I do about 250 miles a week on Zwift and I really wanted a premium cassette for buttery smooth shifting and this 11-36 Force cassette delivered!!! I got it on a daily special for 65 dollars and went a head and got an 11-32 while I was at it. I did the whole Planet Hoth thing last year but after my insulated water bottles froze solid I knew this year I would spend the cash and stay in my living room. I normally run an 10-42 Sram XX1 1199 MTB cassette on my carbon Giant TCX but after demoing Zwift at the LBS I learned the hills on Zwift were about 70% of real hills!!! this a perfect indoor training cassette and I would recommend it to anyone serious about cycling. I put 6000 miles on the cassette this summer, and just loved the whole system!!!! At my age, its better to mouline than push the big gears..... I wish they provided cassette from 13,and up, since I never used 11and12....!!!! Good value, works well, and I would buy again. Paired with a CX1 derailleur, this cassette offers plenty of range. Haven't dropped a chain yet. I live in WA and we do have some longer climbs so I wanted some extra gears as I do more fondo's. This gearing gives me more range to climb with less pressure on my knees than before. I ride sram 1x on the front and this gives me everything I need on the low and high end. It's great to be consistent and use SRAM throughout the entire drivetrain. Thus, I purchased this cassette for my cyclocrossgravel grinder bike. No issues, everything works like a charm. I needed the extra gearing for Rasputitsa (ouch). All's well that ends well. My bike came equipped with Shimano Ultegra but I prefer the SRAM cassettes & SRAM chain. Smooth shifting and very quiet.